Plage-Sud is a sprawling holiday camping site close to the long sandy beaches of the Côte d’Argent in Landes. Superb facilities and services help ensure a comfortable stay, while this fantastic location guarantees an unfrogetable experience. For your mobile home, this camping holiday destination also has a dedicated service area. 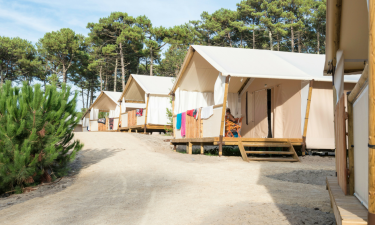 Situated in the seaside resort of Biscarrosse-Plage, this 28-hectare LuxCamp is perfect for catching waves off the Atlantic coast or relaxing on a peaceful beach. Sweeping coastlines and lush forests surround this luxury camping destination to create a vibrant atmosphere for your next holiday. 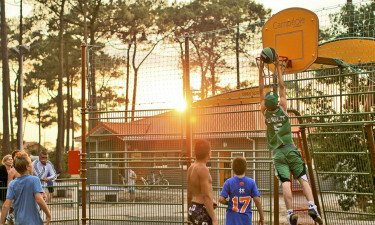 This luxury camping site has fabulous facilities, including a multi-sport area for basketball, football and handball. There are also table tennis tables and an entertainment room with games. During the summer, there is an on-site snack bar and bakery. Along with playgrounds, a play area with a trampoline and bouncy castle keeps children busy. 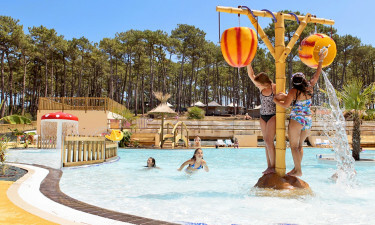 Camping Plage-Sud is close to Biscarrosse’s town centre and its beaches. This makes it easy to walk to shops, the cinema, or nearby restaurants and bars. With the sandy beach of Biscarrosse about a 15-minute walk away, this holiday camping site is perfect base for fans of water sports, including surfing. If you want to escape the heat and cool down, there are two swimming pool and paddling pools for younger campers. Both pools are heated for chiller days. For thrill seekers, there is a landscaped water slide. You can also unwind in at the spa.